Impressive Supreme Novices' Hurdle winner Labaik could run in open company at the Punchestown festival as trainer Gordon Elliott bids to secure enough prize-money to land a first trainers' championship. The quirky Labaik – who has displayed a tendency to refuse to race but was on his best behaviour when springing a surprise at Cheltenham – has been entered in the €250,000 Betdaq Punchestown Champion Hurdle as well as the Herald Champion Novice Hurdle. "We never made a secret about how good we thought the horse was before Cheltenham, he just wasn't brilliant at jumping off [at the start] sometimes," said Elliott. "We've put him in the Champion Hurdle at Punchestown and that's a possibility. "He's definitely running at Punchestown so if he doesn't go for that race he'll line up in the Champion Novice Hurdle on the opening day. He's in great form. He just does what he has to do at home and I'm looking forward to his next run." The Champion Hurdle is worth €150,000 more than its novice equivalent, which could tempt Elliott, who is battling Willie Mullins for the title. Elliott, who was crowned the leading trainer at the Cheltenham festival with six winners, is €360,000 clear of Mullins and is 1-3 favourite to win a first title, but there is still plenty to play for with €2.9 million up for grabs at Punchestown, which runs from Tuesday, April 25 to Saturday, April 29. 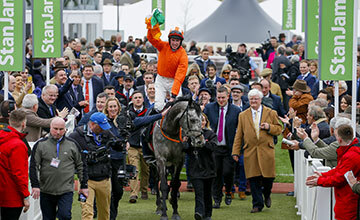 Elliott didn't send a large raiding party to Aintree and has kept his big guns back for Punchestown, where his formidable team will include the likes of Mares' Hurdle heroine Apple's Jade, Triumph Hurdle runner-up Mega Fortune and Champion Bumper winner Fayonagh, who produced an astonishing finishing burst to prevail having completely blown the start. "She's normally great starting off and it was a shame she got left at Cheltenham. Jamie [Codd] gave her a brilliant ride to recover and she must be a really tough mare to have done what she did," said Elliott. "Jamie recommended her to the owners and she won by 20 lengths in a Listed bumper on her first start for us so she's been great. We've got the option of the championship race or the mares' contest with her." Fayonagh will be ridden by Jamie Codd, who is battling for honours of his own and is level with Patrick Mullins in the amateur riders' championship.